In 1508, Juan Ponce de León founded the original settlement which he called Caparra. 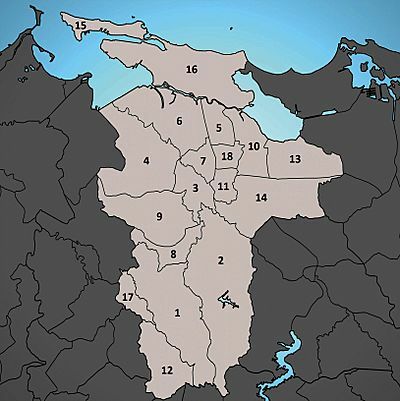 It was named after the Province of Caceres in Spain, the birthplace of Nicolás de Ovando, then the Governor of Spain's Caribbean territories, Today it is part of the Pueblo Viejo sector of Guaynabo, just to the west of the present San Juan metropolitan area. 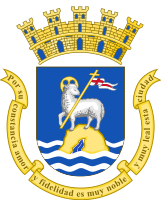 A year later, the settlement was moved to a site then called Puerto Rico, Spanish for "rich port" or "good port", after its similar geographical features to the town of Puerto Rico of Gran Canaria in the Canary Islands. 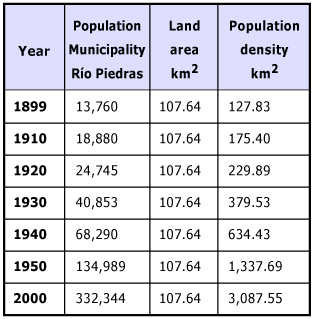 In 1521, the newer settlement was given its formal name, Puerto Rico de San Juan Bautista. 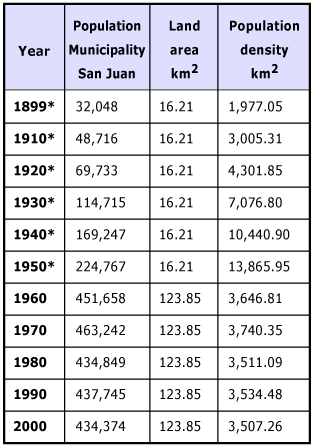 The ambiguous use of San Juan Bautista and Puerto Rico for both the city and the island in time led to a reversal in practical use by most inhabitants: by 1746 the name for the city (Puerto Rico) had become that of the entire island, leading to the city being identified as Puerto Rico de Puerto Rico on maps of the era. 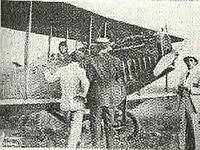 On the other hand, the name for the island (San Juan Bautista) became the name for the city only after the occupation of the island by the United States. 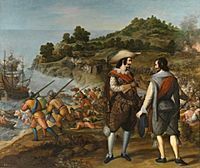 The city was witness to attacks from the English led by Sir Francis Drake in 1595 (in what is known as the Battle of Puerto Rico) and by George Clifford, Earl of Cumberland, in 1598. Artillery from San Juan's fort, El Morro, repelled Drake; however, Clifford managed to land troops and lay siege to the city. After a few months of English occupation, Clifford was forced to abandon the siege when his troops began to suffer from exhaustion and sickness. 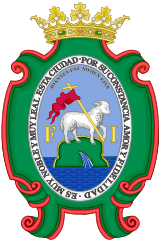 In 1625 the city was sacked by Dutch forces led by Captain Balduino Enrico (also known as Boudewijn Hendricksz/Bowdoin Henrick), but El Morro withstood the assault and was not taken. 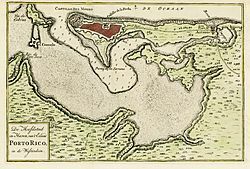 The Dutch were counterattacked by Captain Juan de Amezquita and 50 members of the civilian militia on land and by the cannons of the Spanish troops in El Morro Castle. The land battle left 60 Dutch soldiers dead and Enrico with a sword wound to his neck which he received from the hands of Amezquita. The Dutch ships at sea were boarded by Puerto Ricans who defeated those aboard. After a long battle, the Spanish soldiers and volunteers of the city's militia were able to defend the city from the attack and save the island from an invasion. 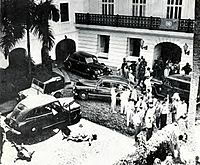 On October 21, Enrico set La Fortaleza and the city ablaze. 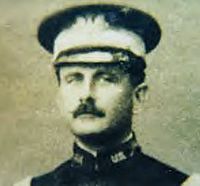 Captains Amezquita and Andre Botello decided to put a stop to the destruction and led 200 men in an attack against the enemy's front and rear guard. They drove Enrico and his men from their trenches and into the ocean in their haste to reach their ships. 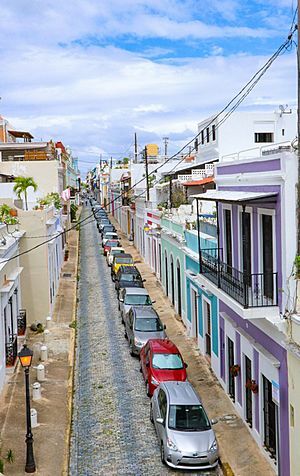 The architecture of San Juan is very diverse, due to its size and all the cultural influences received during its existence. 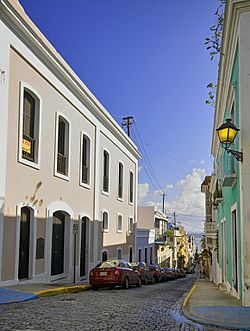 The oldest part of the city, known as Old San Juan, mostly features the influence of Spanish architecture. This part of the city is comprised by a network of "setted" roads usually surrounded by ancient, two-storied houses built on masonry. Some colonial structures have been restored and serve either as government offices or museums. 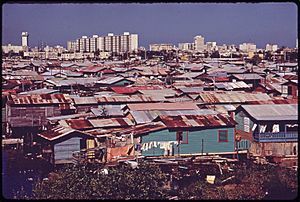 Some examples are the Ballajá Barracks, which now serve as museum and headquarter of several cultural organizations; La Fortaleza, which has served as the residence of the Governor of Puerto Rico since the 16th Century; and the Ancient Welfare Asylum, which now houses the Institute of Puerto Rican Culture, among others. 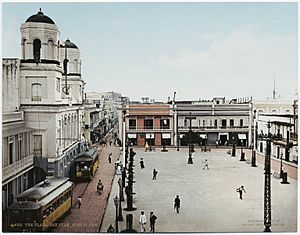 Old San Juan also features several public squares, like the Plaza de Armas, located in front of San Juan City Hall; and cathedrals, like the Cathedral of San Juan Bautista. 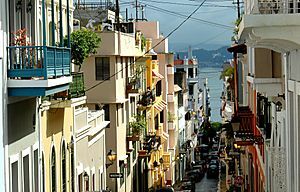 Old San Juan is also notable for being partly enclosed by massive walls and fortifications built by the Spanish government. San Juan, Puerto Rico Facts for Kids. Kiddle Encyclopedia.